Björndal, Trond, Mintewab Bezabih and Daniel V. Gordon. 2012. 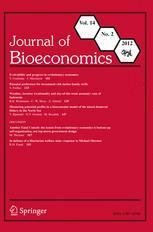 “Measuring potential profits in a bioeconomic model of the mixed demersal fishery in the North Sea.” Journal of Bioeconomics 14:2: 147-166. This paper measures for potential profit in the North Sea mixed demersal fishery for cod, haddock and whiting. Dynamic bioeconomic models for three UK fisheries are developed, incorporating both population dynamics and economic structure. Actual profit in 2006, for the three UK fleets included in the analysis, is estimated at £10.3 million. If the TAC remains unchanged but vessels are allowed to harvest at near efficient levels with fleet size reduced accordingly, potential profit is measured at £34.5 million. If demersal stocks are allowed to recover to near optimal levels potential UK profit exceeds £185 million. This indicates substantial profit dissipation due to overcapacity and stock depletion in the fishery. The results of the paper should be of policy interest and will add to the empirical literature on resource profits in mixed demersal fisheries.